For the common applications, Tsubaki can provide you with an outstanding range of Attachment Chain. The chain is manufactured according to the appropriate American Standards. 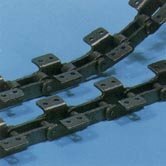 This chain is an economical choice in drive applications where the speed is low, the load moderate, or the center distance is relatively long. These chains provide a high quality conveying medium for material handling equipment, road building machinery, textile machinery, farming implements, and baking packaging and bottling equipment.